Thinking of Developing That App?? The Third, Fourth, Fifth Screen Experience? Content Marketing and Persuasion Architecture – Ambility Perspectives on The Return of the Product Manager? After some time away from these pages to devote to related interests, the Ambility team has been recently stirred by vibrant activity in voice-controlled screen offerings by some rather large players. Amazon’s Echo Show is not new but recently it was joined by offerings from both Google and Facebook, creating a suddenly crowded field of voice-controlled digital assistants equipped with displays. In spite of the appearance of three of the world’s largest, most prominent tech companies into the space, the Ambility team can’t help but think that these devices may have a limited shelf, or counter-top, life. Will consumers sacrifice valuable home real estate for a device no more sophisticated, and much less flexible in its usage, than their tablets? These are not un-sophisticated companies. They obviously have considered the value their devices will provide and feel confident the market will reward them. So what is that value? Home Hub and Echo Show work to respond to your voice commands with content, providing data-rich visuals of weather forecasts and restaurant recommendations, for example, based on your voice searches. Facebook’s Portal, by contrast, seems to have been built primarily for video chat, although the larger model, Portal+, also operates as a pretty great TV. It offers by far the largest screen display of these new devices. Once search results are provided, Google’s Home Hub allows you to drill down further into content with some simple voice commands to avoid having to use your fingers. Scrolling through recipes or restaurant listings is simple using your voice, really freeing you up to multi-task. And if it’s directions to your restaurant of choice you want, Home Hub can send those to your phone so you can be on your way without ever having to scroll and peck with your finger. Interestingly, and uniquely, Google’s Home Hub does not include a camera of any kind, so it is not a station for video calls. But it does integrate well with home mini and Nest devices. Echo Show carries over the smart home possibilities available through Alexa, with some clever display additions that improve on the first Echo Show. Home controls, in particular, now include helpful content to confirm completed requests and refine your commands with on-screen dimmers and area controls, for example. It’s large screen and integration with Amazon Prime also makes it a friendlier viewing device than the much smaller Home Hub. Facebook’s Portal works hard to make hands-free video conferencing richer than most non-commercial offerings and by and large succeeds with some innovative camera work that current tablets will struggle to duplicate. Subject tracking software follows you around the room and zooms in and out so whomever you’re talking to can see what you’re doing as you continue to converse. Facebook’s stated aim is to make video chat like you are speaking to your friends in person. As for content beyond device controls and calls, however, the device relies on Alexa to provide access to weather, Spotify, and most anything else. All in all the new product offerings from three of the largest internet companies in the world are most interesting because of their differences. That their unique features focus on such different use cases shows the multiple ways screen-based, voice controlled digital assistants can help us, and their future in our homes seems assured. The Ambility team can’t help but consider that one product producer has not come out with a fixed-location digital screen assistant. Apple may very well introduce a table or counter-top version of the iPad (iClock? iRecipe?) 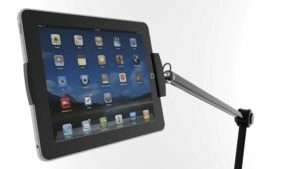 but our question is “why would they?” Logitech and Targus make cases that turn the iPad into a great standing device already. And it’s easy to move from one room to another.